I never would’ve believed that I’d say so, but I think my synth collection has finally reached it’s saturation point. None of the modern synths interest me and when it comes to vintage analogue gear, Jupiter 6 and 8 not included, I now have everything I ever dreamt of having. Ten classic analogue synths and a bunch of other vintage gear is enough for anyone, I think. Then again this is a feeling familiar to me. Collecting is a hobby that usually goes in phases. I know this from my earlier collections of boomboxes, vintage video games and 80’s action figures. Collecting synths is not too much different from those, except that it costs a lot more money. In my collecting I’ve always been limited by my low income and therefore have been forced to achieve my goals by swapping and other means. I’ve never thought of my synth-collecting as pure collecting. Instead of showpieces my synths are more like tools to me and I use them daily. There’s always at least one good reason to own a certain synth. For now, I’m content with my japanese wall of synths. There’s something for everything. There’s 4 excellent monosynths, 4 classic polysynths, a small and portable modern synth and a very nineties-sounding rackmodule. There’s only a couple of things still missing. I really really need a Roland Space Echo RE-201. 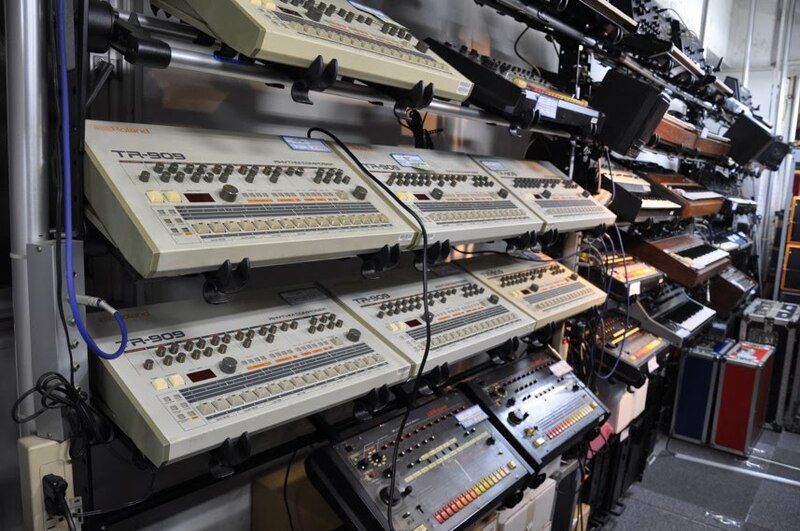 I’m also in desperate need of a classic Roland Drum Machine – 707, 808, 909 or even a 606 would do. Some of the Roland‘s SH-series synths also tickle my fancy. I’d also happily trade my DW-8000 for a JX3P or a Poly-61. I’ve also thought long and hard about getting the new Doepfer Dark Energy and Dark Time, or maybe a vintage step sequencer instead? I’d also kind of like to have my fingers on a Korg Kaossilator Pro or a Roland Gaia. But that’s definitely it. That’s enough for me. One day I'll go to Five-G in Tokyo and not buy a single synth. I'll just have a good look.